Today I'll be introducing another new product!
" WHY ISN'T THIS PRODUCED EARLIER?!?" I'll elaborate on that later. but first, a short introduction of ADORE for those who didn't know about this brand! 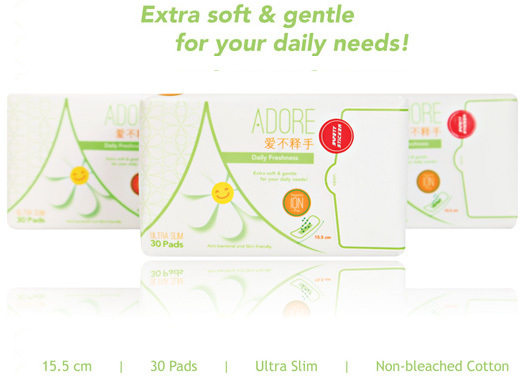 ADORE takes on a revolutionary approach making their sanitary pads both ultra slim and hygienic. 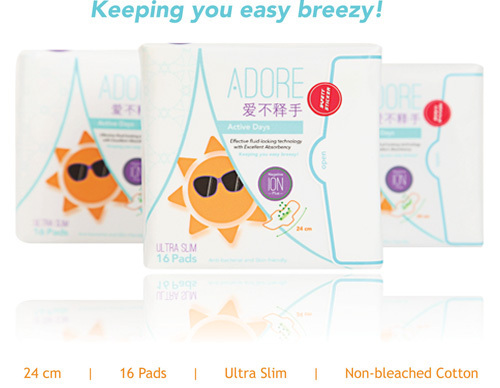 ADORE’s feminine hygiene products are fast becoming popular. The anti-bacterial functions have been laboratory tested and proven to be extremely effective in suppressing bacterial growth caused by prolonged wearing of sanitary napkins and pantyliners. Their super high absorbency properties ensure you can forget about embarrassing moments caused by side leaks and backflow. In addition, you can be assured that ADORE products are not bleached as no recycled cotton is used which greatly reduces the risk of skin reactions due to sensitivity. 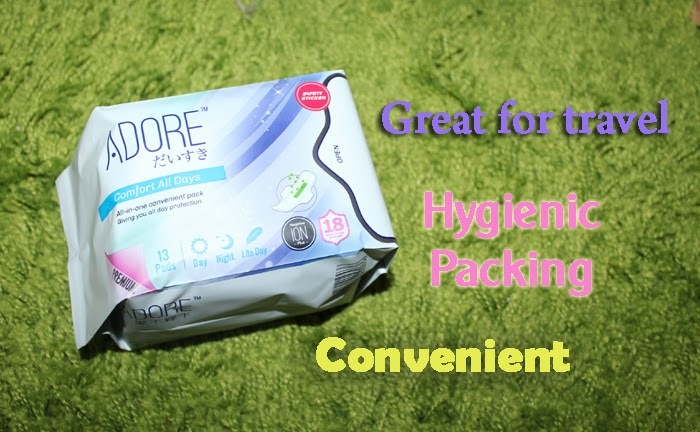 ADORE is also recommended by gynaecologist as a consumer-safe sanitary pad that prevents vaginal infection! 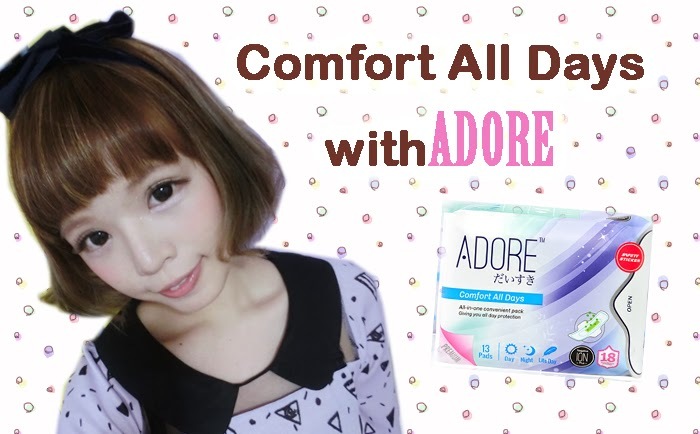 I've never seen a product like Comfort All Days in the market yet..
ADORE だいすき - COMFORT ALL DAYS is a Combo Pack of 13s which was developed as an All-in-One pack which is convenient for tourists, airline flight crew, holiday makers and those who like the convenience of just purchasing a pack of sanitary napkins which can last them throughout their period. 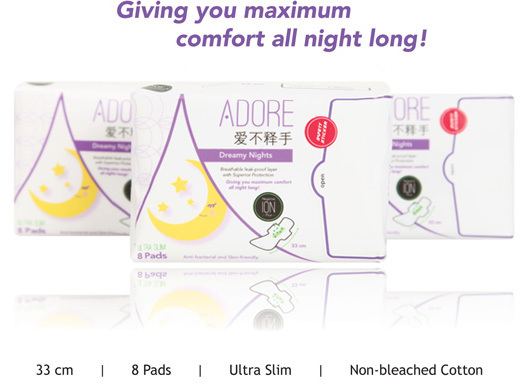 ADORE だいすき - COMFORT ALL DAYS consists of 6pcs (24cm) Day pad, 3pcs (28cm) Night pad & 4pcs (19cm) Lite Flow Day pad which is suitable for "pre" and "post" period use; all conveniently packed into a single pack! Before this, I normally buy different packets , separate them and pack them together into one fluffy bag. It's much costlier and messier that way!! And during the most unfortunate event when "it" came unexpectedly, I'll just buy the night wear sanitary pad overseas cause I don't want to waste my luggage space putting 2-3 packets of different sizes. But.... Normally, the night wear is so fat and uncomfortable to wear throughout the day! Especially when I'm wearing tight jeans!! So you can imagine how much i wanted to thank ADORE when they introduced this to me the first time! One packet and you'll be assured for the whole trip! They've got night wear, day wear and for pre and post periods! Not only that, they have special packaging that allows you to keep your pads clean and neat! You won't want your pads to be exposed to dirt and moisture! Stick the cover back everytime you use them! then the unused pads will remain clean! If you're travelling, i would definitely recommend this pack for you! And if you're wondering, their sanitary pads are really absorbent and comfortable! Feeling fresh, comfortable all day!! COMFORT ALL DAYS (UP $4.90 – INTRODUCTORY OFFER - $3.70) – Limited period only from now till End April at Watsons, SaSa, Sheng Siong & Giant.